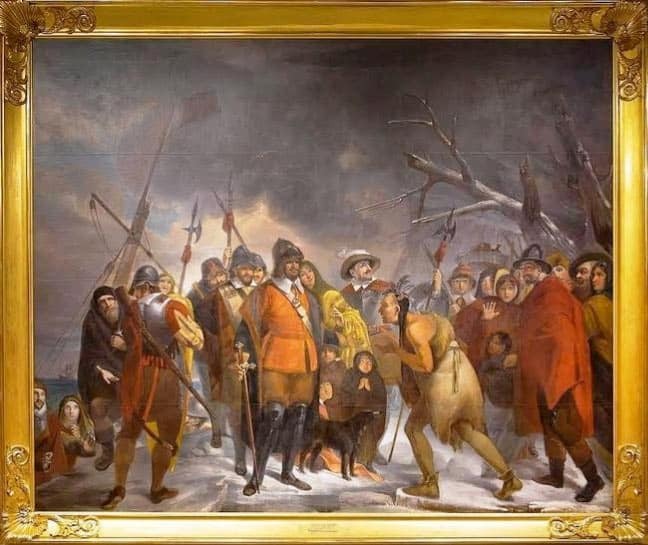 Thanks to a grant from the state, restoration work started on the iconic Henry Sargent’s “Landing of the Pilgrims” in April 2015 at The Pilgrim Hall Museum in Plymouth, Massachusetts. The restoration work was expected to finish in June, but even in the early weeks some incredible details began to emerge from this dark grimy painting. 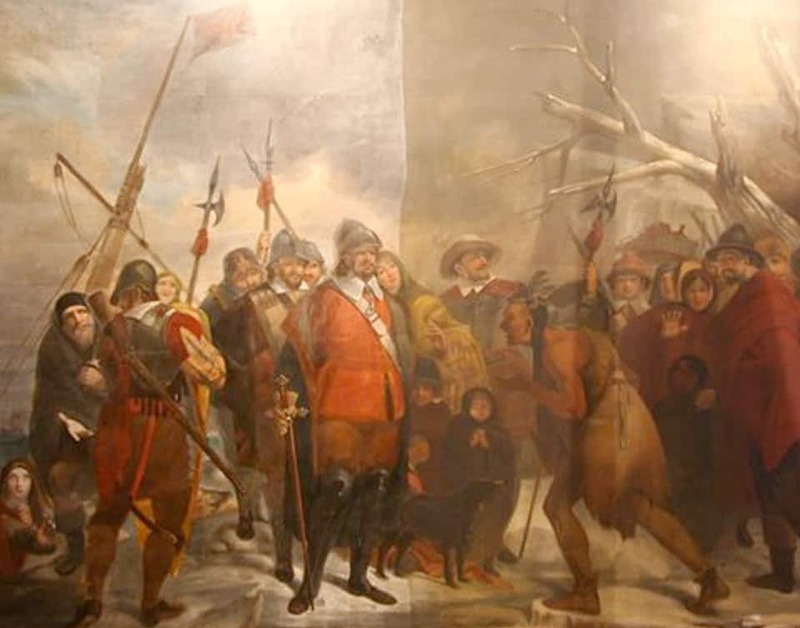 The painting had hung for 191 years on the east wall of Pilgrim Hall Museum’s main hall, which was first climate controlled in 2008. Because it was subjected to heat, humidity, soot, dirt, smoke and salt air over the years, the canvas had become darkened and soiled. It also showed signs of typical destabilization and some loss of paint. After over 2 centuries of surface grime, dust and numerous layers of varnish were removed. The sky that looked dark and dull did in fact contain blue sky between the clouds, with seagulls flying in it. The dirty ground is in fact covered in snow and preliminary cleaning of Myles Standish’s leg armour, revealed that there are rivets holding the metal flaps together. The museum relocated some of its exhibits so that people could witness this restoration transformation and even set up an online live feed as well for those who couldn’t make it to gallery in Plymouth. This painting is a work of national significance for American people, as the painting itself played a role in establishing Pilgrims as the forefathers of America. 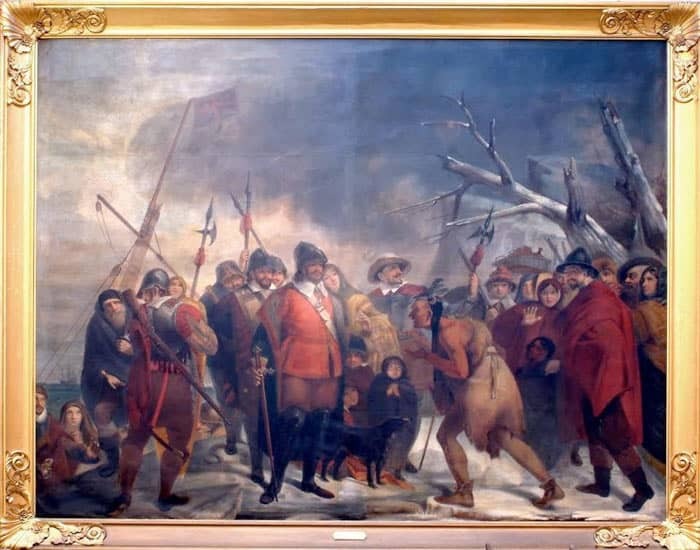 Restored Landing of the Pilgrims painting. On 12th June, the museum directors toasted the end of the restoration of the Landing of the Pilgrims. The Henry Sargent painting was revealed and the conservators and public officials who made the restoration possible were honoured. “Conservation is just an approach to bringing history out,” David Olin, addressed the crowd of art and history devotees gathered to see the newly restored painting unveiled. David Olin was the chief conservator for the restoration, and his firm Olin Conservation Inc. carried out the project. Bill Adair of Gold Leaf Studios carried out the restoration of the painting’s gilded frame. Former State Senate President Therese Murray was applauded by the crowd, as she helped to secure the $210,000 state grant that allowed the work to happen. Without this, funding might have taken years to acquire. Local historians had hoped that the restoration would be completed in time for the town’s 400th anniversary in 2020. The Landing of the Pilgrims is not only valued as an art history artifact, but as well as a historical document it’s also an object which can be the subject of varying interpretations for years to come.